Years ago, I read an article about a great BLT in the middle of the winter, where the tomato jam substituted really well for a fresh tomato. I had to try it. I liked it so much that I now make it in a huge batch in my biggest crock pot, then can it so I can have it all the time. 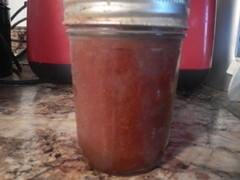 The kick from the ginger and the cumin just hits my perfect flavor for tomato jam. I love it on not only BLTs, but also on a tuna sandwich, a grilled cheese, and any sandwich, really, where you’d really like a lovely fresh tomato but the season isn’t right. Here’s what I do, slightly changed (less sugar) and quantities for a big 6 quart crockpot, which makes up 11 half pint jars. 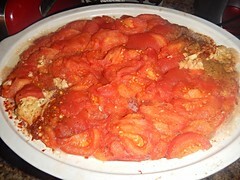 I core the tomatoes, then freeze them. The peels slip right off when they thaw. Throw everything in the crockpot, keep it on high without a lid during the first day, then cover with a bit of an opening and put on low overnight. The next day, hit it with a stick blender and turn it back up to high and cook it down until it’s nice and thick. Put the jam into half pint jars and waterbath for 15 minutes.